When I saw the label on these I had to take a second look. I really hate katakana it is so hard to read. 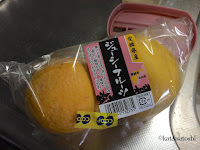 A little larger than a tennis ball, these were indeed "juicy" and after looking online, they are a type of grapefruit. I squeezed two for breakfast. The juice is tart but not sour. I think putting them into a salad might be nice too. I'll keep my eye for them the next time I go to the market. It's Friday. The past week our temps have been krazy hot and the humidity has also just started, hope the weather where you are is nicer. 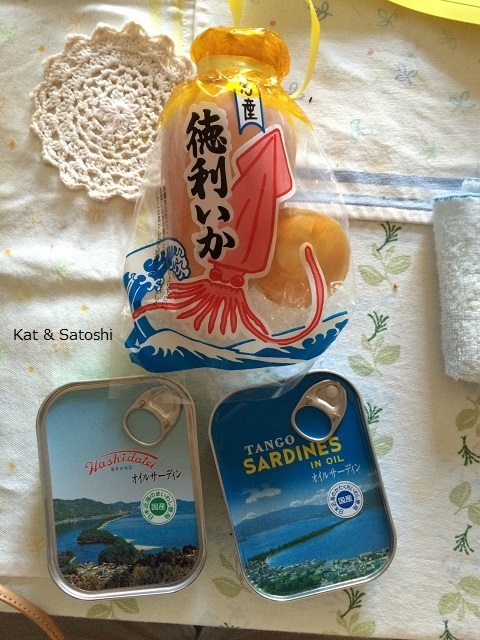 Remember that tokkuri ika we brought back from Amanohashidate? Well, Satoshi got to try it this past Sunday. He says he's gonna use this one more time then eat the ika. 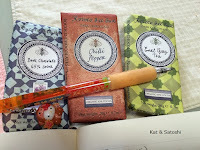 Way back when I first starting discovering different chocolates, I heard about Rococo, a chocolatier in the U.K. 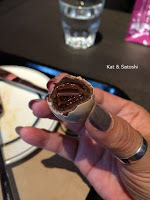 When I met up with Tamakikat, she was kind enough to share some chocolates with me...from Rococo! 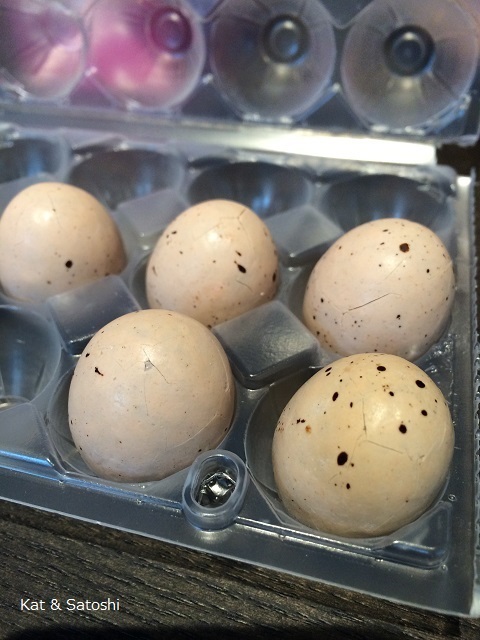 Their Superior Seagull Salted Caramel Eggs...rich salted caramel center coated with milk chocolate and a thin shell. This was really good but one was enough! Their bee bars, 20 grams of 65% dark chocolate. Our favorite was Earl Grey. 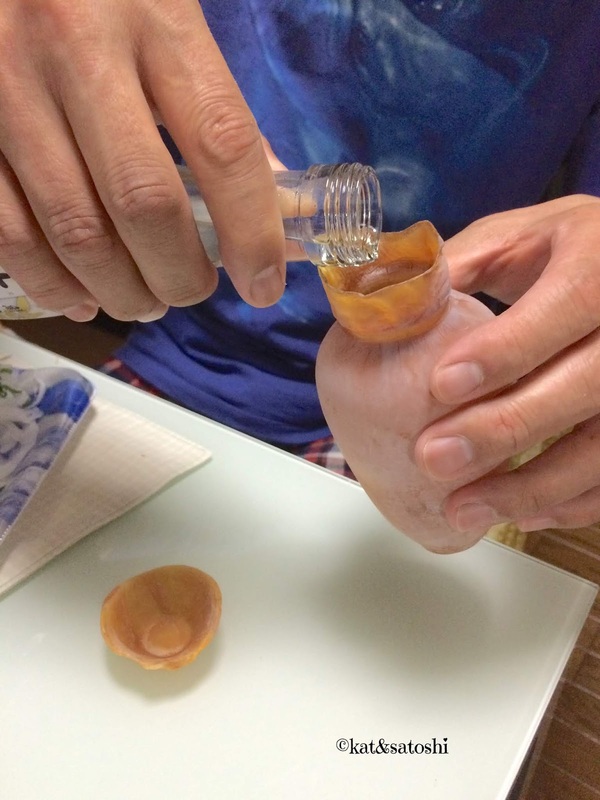 I hope they bring a shop to Japan soon, thanks again for sharing Tamakikat! Met up with Tamakikat in Osaka before her appointment. 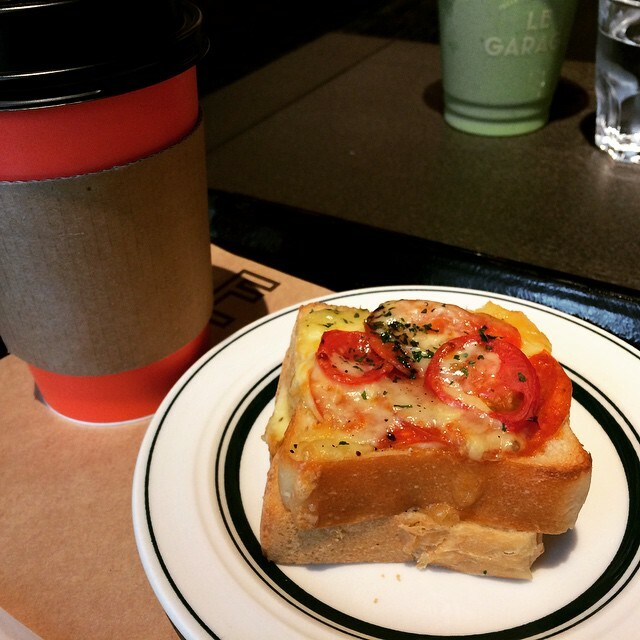 I had this croque monsieur thingy while she had a green smoothie. 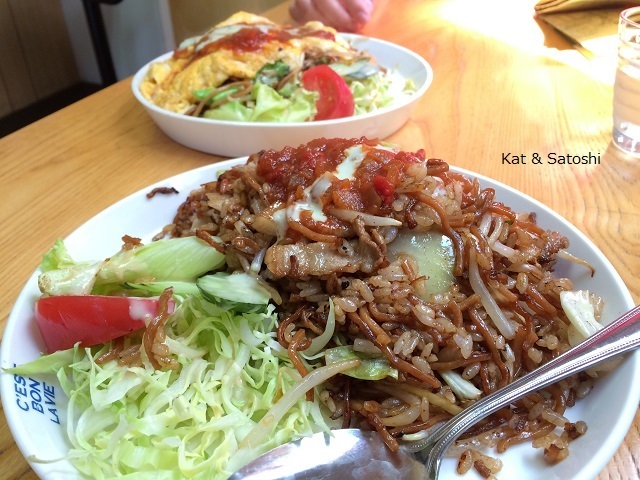 After Satoshi's German class, he wanted to go meet up with some classmates for a study session, so first we had lunch at South Swell Cafe. 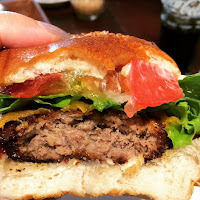 The burgers are huge here! 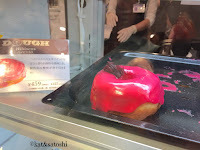 but the prices are super reasonable...800 yen. I had the South Swell Burger which came with bacon, bbq sauce and I think cheese. Satoshi ordered their Avocado Burger...900 yen and with 200 yen plus he added coffee. 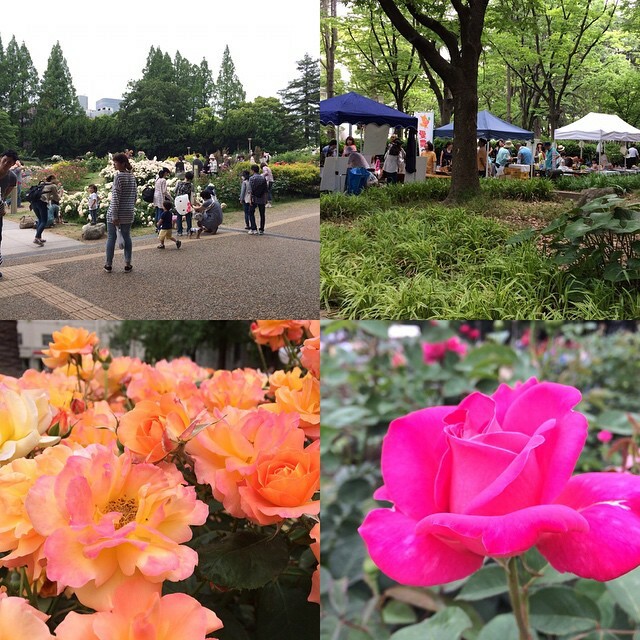 While I waited for him, I checked out the Utsubo Park Rose Festa and read my book. There were also tons of furry kids!! After Satoshi's study session, we walked to Nakanoshima Rose Park. 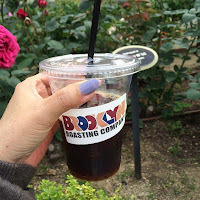 On the way, we bought some coffees and sat in the park. It was dinner time. 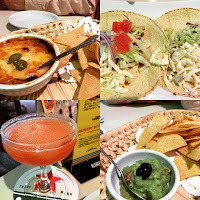 We checked out this mexican place I had bookmarked, Herradura. We tried their guac with chips and ordered two orders of tacos (one with shrimp and the other with chile con carne). An order comes with two tacos. Their food is quite good. We especially liked their chips which are fried to order. We also had their queso con chile (melted cheese with tomato) and chips. Their strawberry margaritas were meh. But we want to go back to try their plates. It was quite a long day, but the weather is still quite nice. Went to check out ému cafe on Friday. I've passed this place many times and had always wanted to have lunch here. Their lunch service starts at 11:30, so I timed arriving at that time...the place was already packed! I was seated at their counter. After my order was taken I was given some chilled vichyssoise (potato soup). This had no temperature spiciness to it. Nor did it have any cheese. When I ordered, I also asked that my drink come out at the same time as my meal. 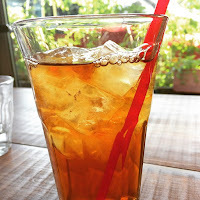 Well, after being served, I ate my lunch, and no iced tea. and then 30 minutes later it finally came out..WT?! Dunno that I'll be back to this place, service seems a bit off. Have been wanting to try Cafe Noto Coffee but since my appointments in this area are usually on a Tuesday, and they are closed, I haven't been able to, until this past Wednesday. According to Tabelog, their lunch time starts at 11:00, so I tried to get there about that time. Well, they no longer serve lunch...boo! They do have sandwiches on their menu but service for them are at 11:30...boo! So, I ordered a pizza toast and iced coffee. Everything is made to order so be prepared to wait. This place has a nice vibe. Lots of light and their music comes off of a record player. 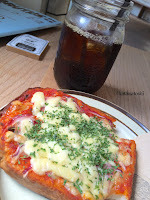 The pizza toast was good! 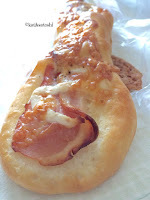 I liked the sauce and toppings which were bacon, some red onion and lots of cheese (and parsley). The iced coffee was nice too, probably a dark roast. I'll come back to try their sandwiches and baked goods. Max Brenner recently opened up a chocolate bar in Lucua 1100. The line is krazy for this place. 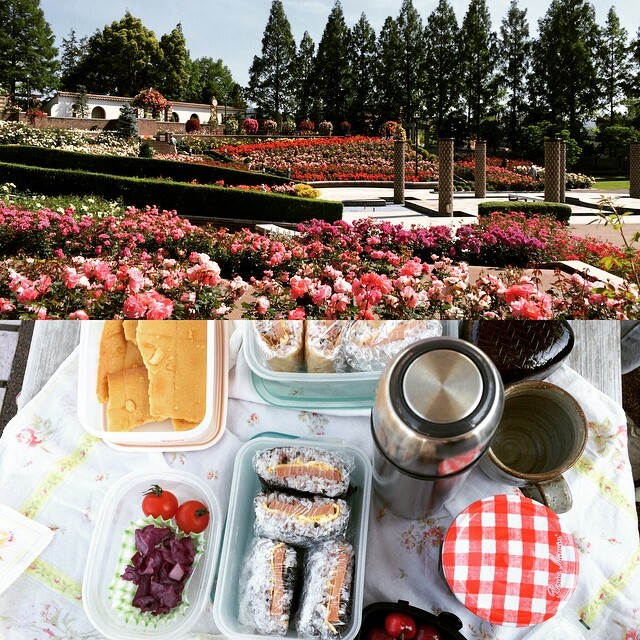 Tuesday, I met up with Kiyomi for "lunch". And since the line for this place wasn't too krazy at lunchtime, we tried the chocolate chunk pizza. 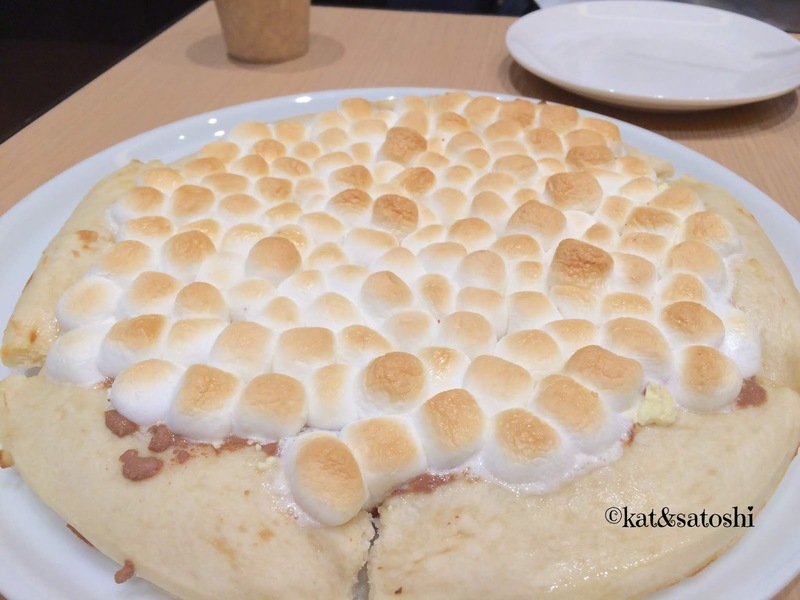 Milk & white chocolate with toasted marshmallows on top. Needless to say we were full after this, so we did lots of walking and window shopping. I'm glad we tried this but probably would go for their fondue or crepe items instead. Hours: 10:00-21:00, open when Lucua 1100 is. 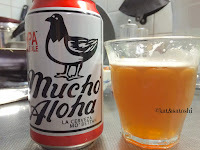 Tried this Mucho Aloha HPA Pale Ale recently. 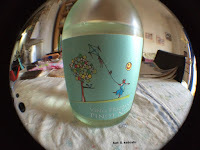 Kinda fruity, easy to drink. 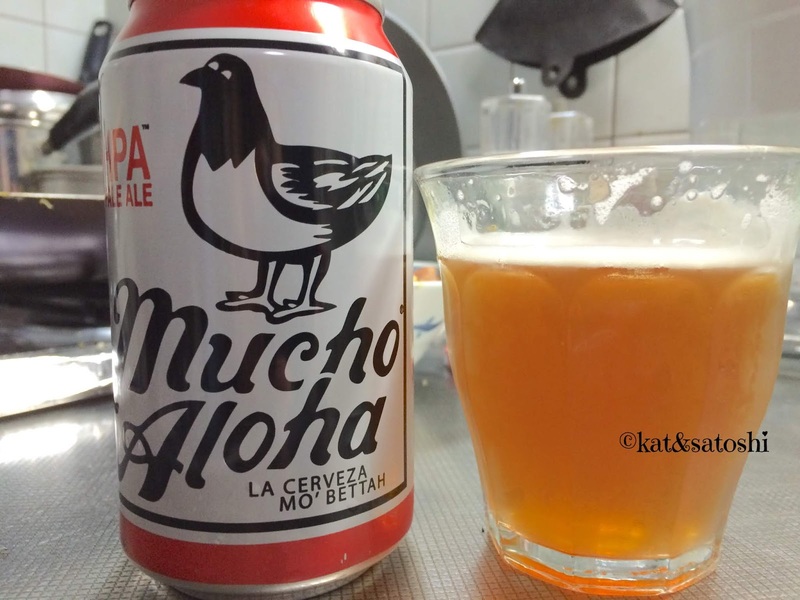 Bummed that it isn't really made in Hawaii though. 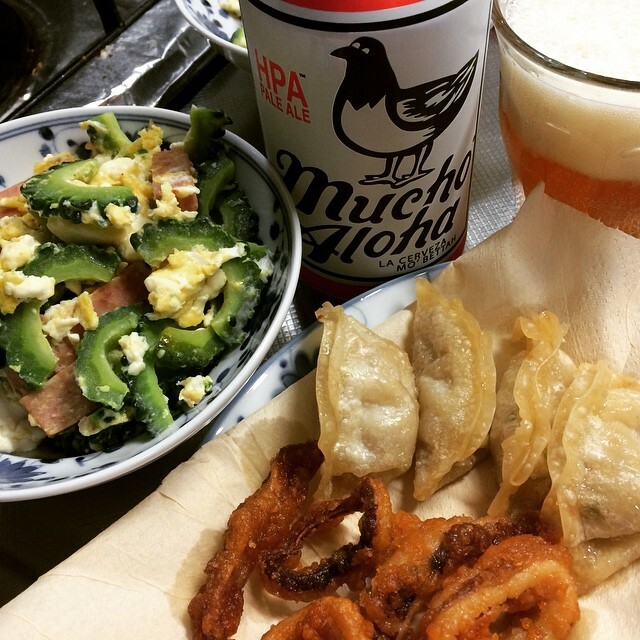 I had this with some goya champuru, fried gyoza and calamari. Dunno that I would buy this one again but I'm glad I tried it. 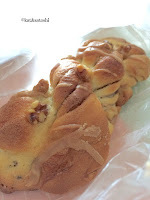 There is a bakery in the Takarazuka area that is super popular, Pannell. 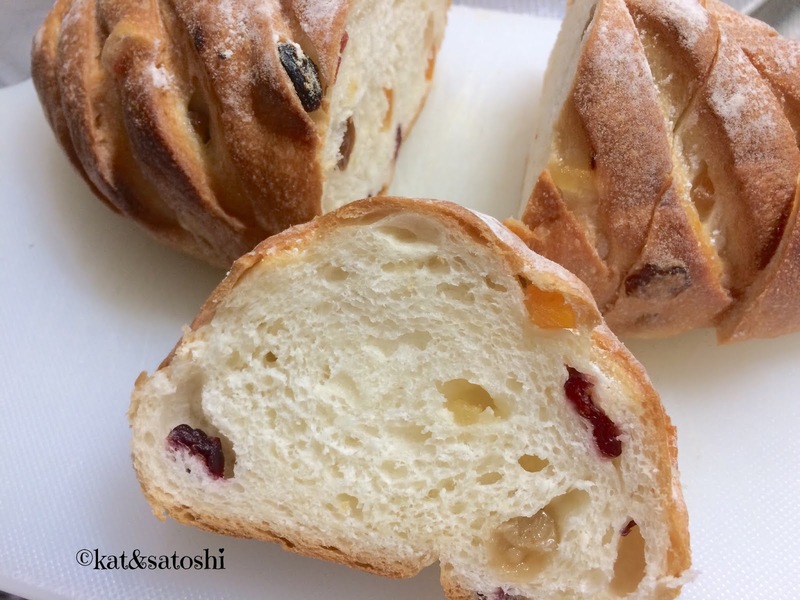 They often sell their bread at department stores and the lines for them are usually really long. 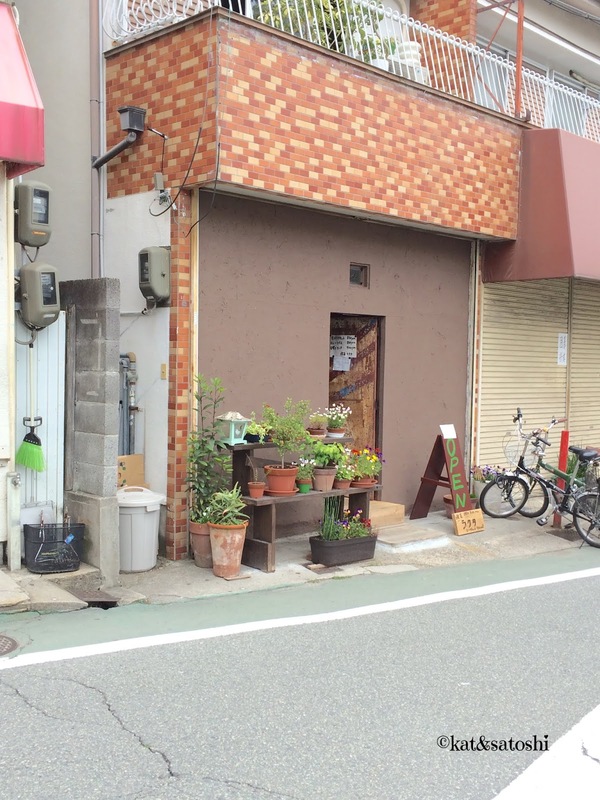 Recently I stumbled upon one of their shops in Nakayama. They don't let you take photos in the store, so I'll just have to tell you about their amazing cash register. It scans the bread and shows you exactly what you bought on the screen. Now, the cashier can't ring you up wrongly, as is sometimes the case at other places. I like how their receipts tell you exactly what you bought too. 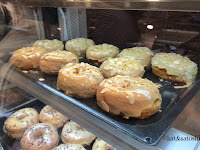 Their maple donut...chock full of walnuts. The bacon asparagus bread...which had more bacon than asparagus. And their fruit milk bread was delicious too! I'm thinking of making french toast with the rest of this loaf. 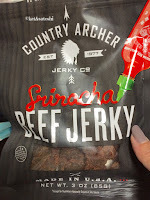 I'm glad we got to try these and that they have a close location for us to visit more often. Closed Mondays and 2 Tuesdays, check their website for more details (Japanese only). Back in March, my Aunty came to stay with us and brought us all sorts of goodies. Country Archer Beef Jerky Sriracha flavor. We just opened it recently...Whoa?! 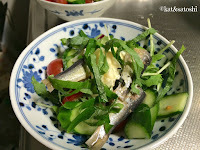 Remember that sardine sandwich we had at Amanohashidate? Well, I recreated it and turned it into a salad. 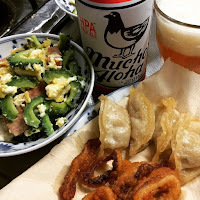 NOTES: If you don't have rakkyo where you are, mix some chopped sweet pickles and some diced onion in some mayo. I love that these sardines are so tender! Definitely making this again. Recently, a huge Tsutaya opened up at the new Lucua 1100. Tsutaya is mostly known for its video rental shops but has recently emerged with bookstore/cafes. This particular Tsutaya is a bookstore/cafe. The interior is rather dark but there are tons of seats for you to grab a coffee and browse their books. I particularly like that they open at 7:00, perfect for when I go to Umeda when Satoshi has his German class. We usually get there before 9:30 and the amount of places serving breakfast at this time is quite limited. In Tsutaya there is a Starbucks and a cafe called Le Garage. 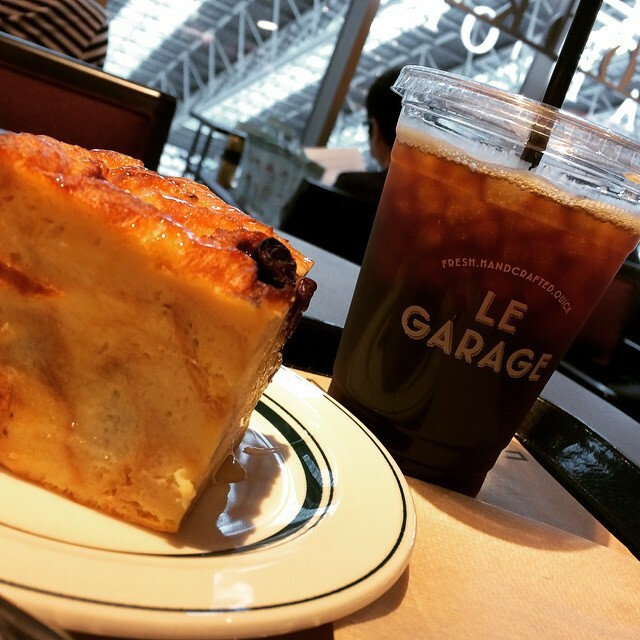 I tried Le Garage's blueberry bread pudding and an iced coffee...650 yen (tax included). The bread pudding was dense and not too sweet and there were lots of blueberries in it. The iced coffee was good. I hope to hang out here more often. 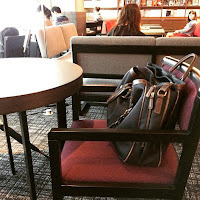 Krazy salaryman (businessman) left his bag at the table next to mine and went MIA for over 30 minutes...he should've paid me to watch his bag! Sunday we went to check out the roses at Aramaki Rose Park. We've been coming here since 2006. We love getting to the park right when it opens so we can eat our breakfast in peace and quiet. This place is getting quite popular, there were tons of people when we arrived on Sunday! 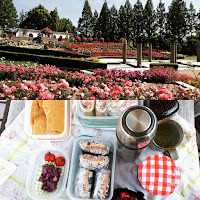 Our breakfast was spam egg onigirazu, cherries, pickles, cherry tomato & island lava cookies. I also made hot coffee for Satoshi and a coldbrew for me. 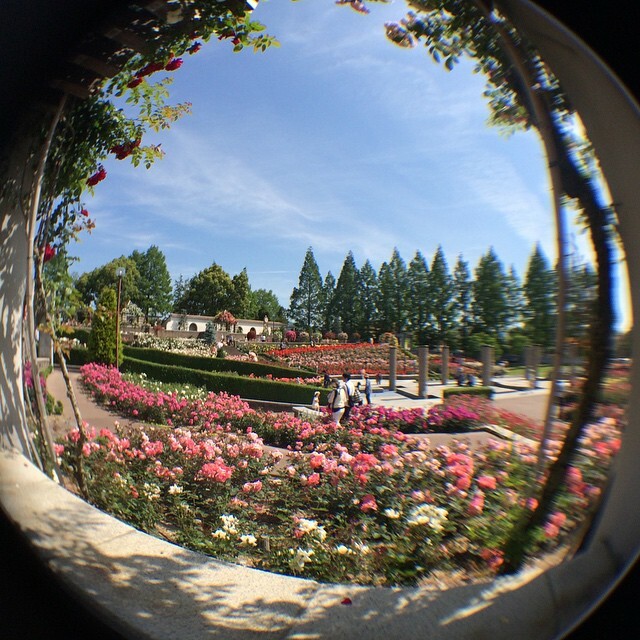 Am loving the fish eye lens. 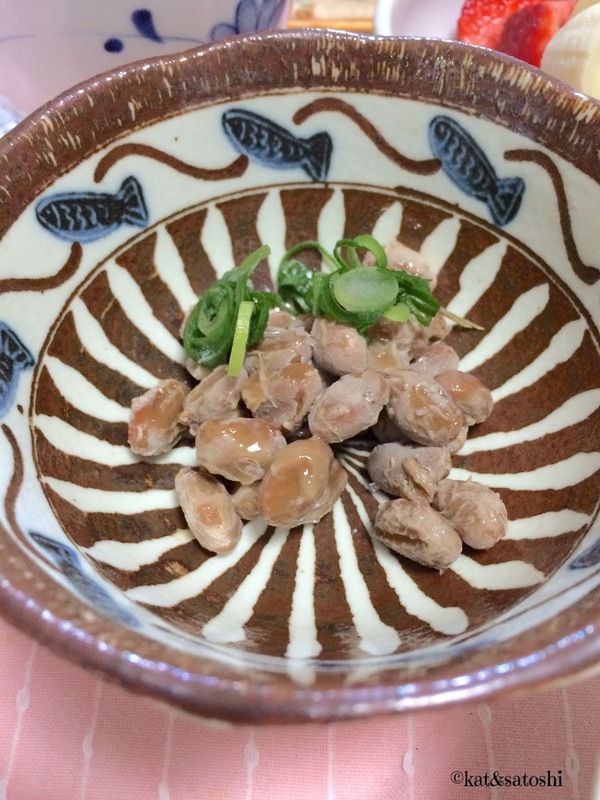 A news program recently featured Koganeya's Naniwara. 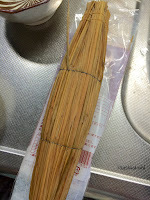 A natto that is made in Osaka and sold in the traditional way, wrapped in straw. 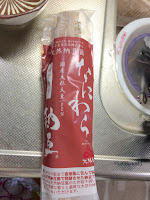 The name is a combination of "naniwa" the name for Osaka and "wara" which is straw. 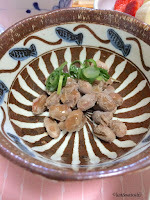 It is a little higher priced than the natto packed in styrofoam, but the daizu (soy bean) flavor is a little stronger and it is definitely stinky. It doesn't come with the Japanese mustard or soy sauce. The package says to sprinkle some salt on and eat it, which we did, but Satoshi added a little shoyu to his. I'm glad we tried this. 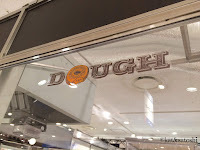 Awhile back, I saw Su-Lin's photo of a doughnut she had while in NY from Dough. I bookmarked it on Yelp and put it to the back of my mind. Then Hankyu advertised a NY Fair...and Dough was coming! 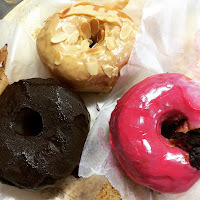 I tried the Chocolate Salted Caramel, Hibiscus and Dulce de leche...459 yen each (tax included). 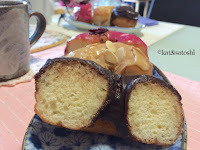 These doughnuts are huge! The ones in our area these days are usually cake type and they are about half the size (and price). I was disappointed with the way they packed these though. The glaze was all smooshed. 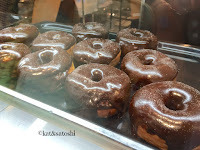 I'm glad I took pictures of the doughnuts in the showcase while we waited in line. 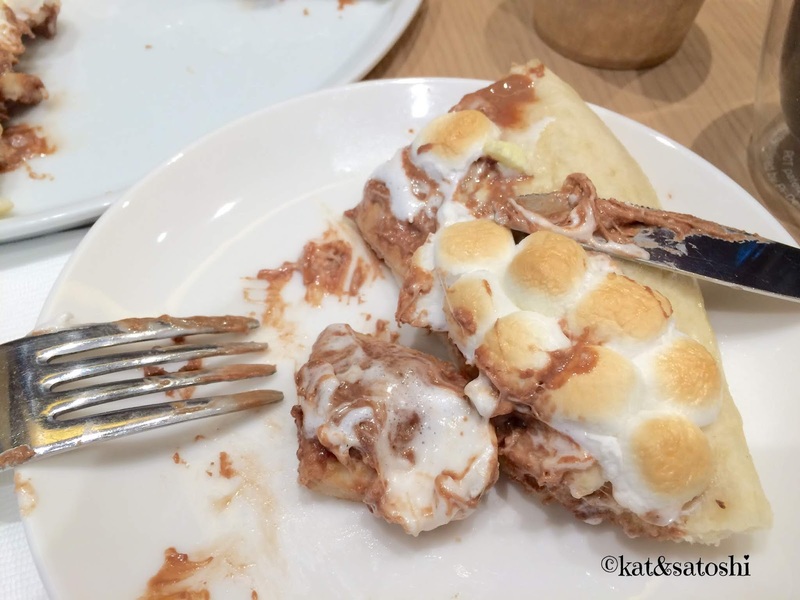 Our favorite was Dulce de leche. Lots of sliced almonds and the glaze wasn't sickly sweet. 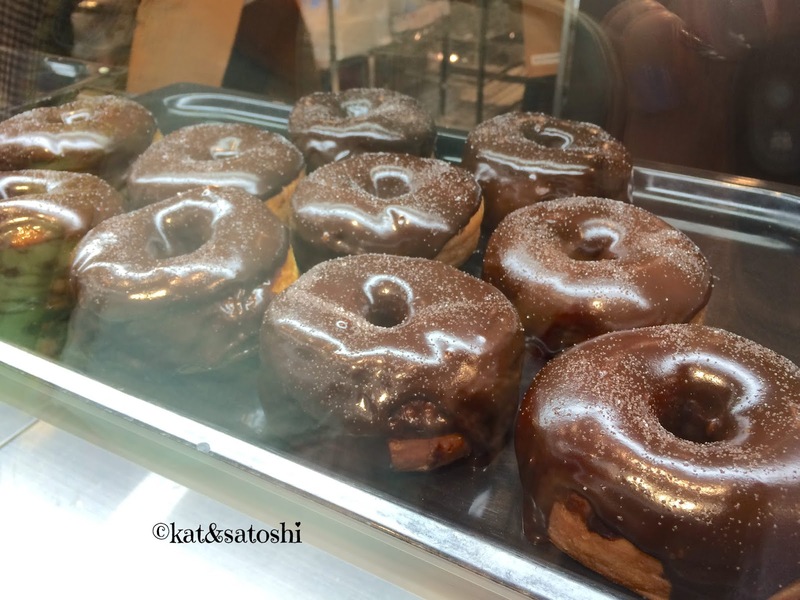 Chocolate salted caramel was way too salty, I think they could've done without the sprinkling of salt onto the glaze (you can see all the salt in this pic). Hibiscus was tart and also had a dried hibiscus on top. 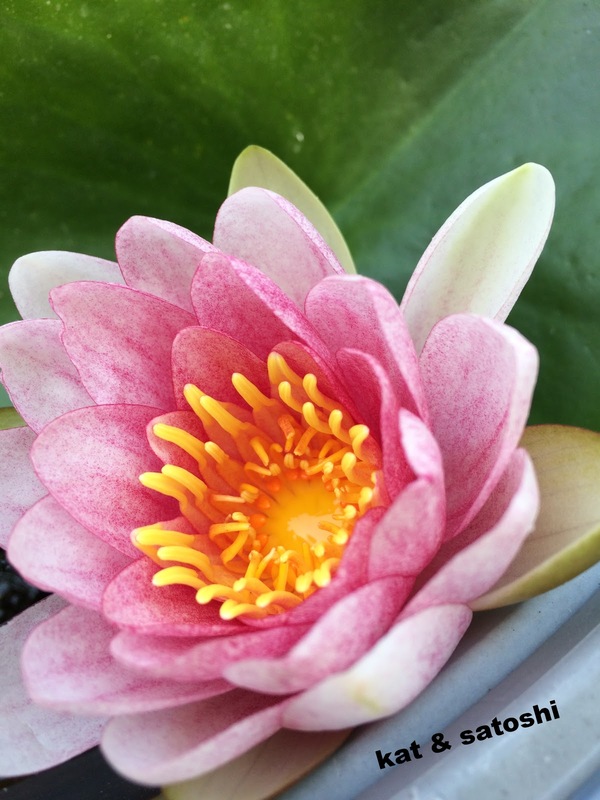 Love the vibrant pink color! What surprised me the most, was that these doughnuts were still soft (and not greasy) even after I kept them in the fridge overnight. I'm really glad we got to try these doughnuts. So, how does that selfie clip work? Here's a shot without the wide angle lens. with the wide angle, you can get more scenery (and more of yourselves) into your photo. 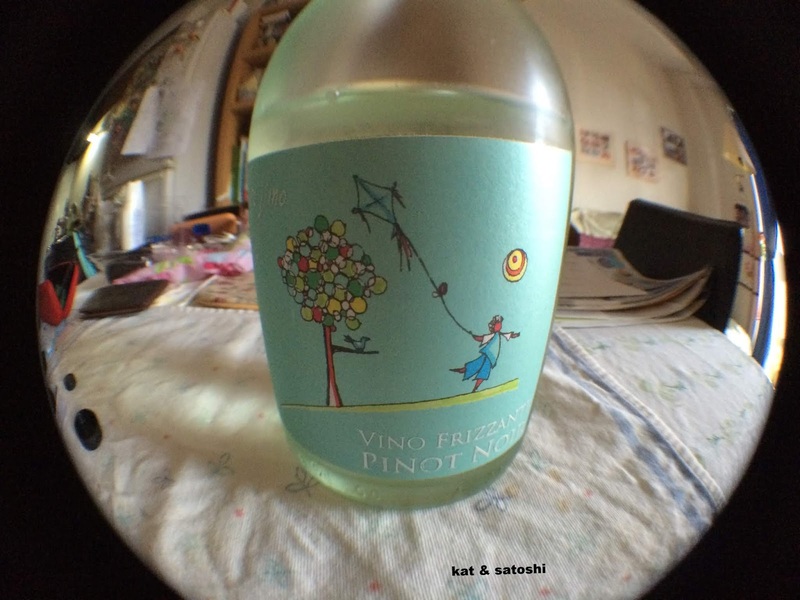 The fish eye lens is just plain fun. This is a lotus flower without macro. 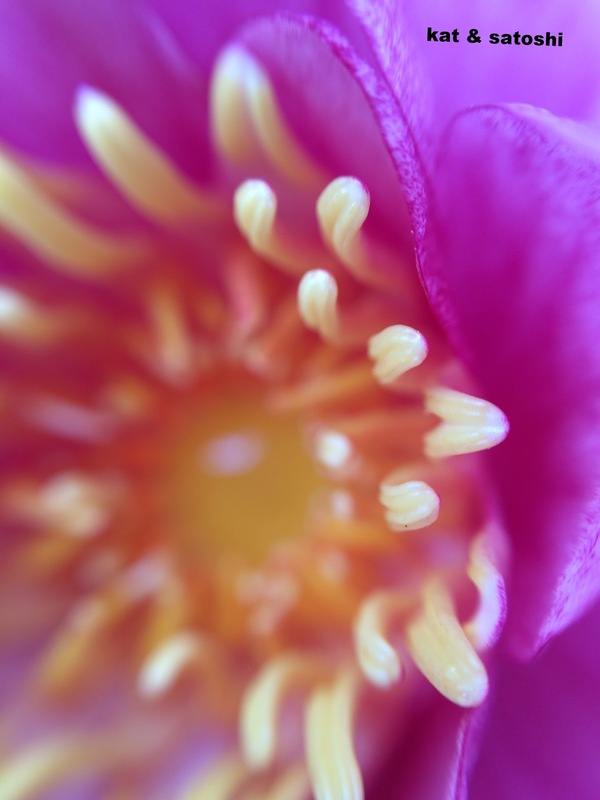 with the macro lens, it will focus on an object up to 1.3 centimeters away, kinda like a magnifying glass! The only drawbacks I feel this lens has is that it creates a vignette when you put the wide angle clip onto your phone. Also because the lenses are teeny I always fear I'm going to drop them. If you have something similar, tell me about your experiences using it. 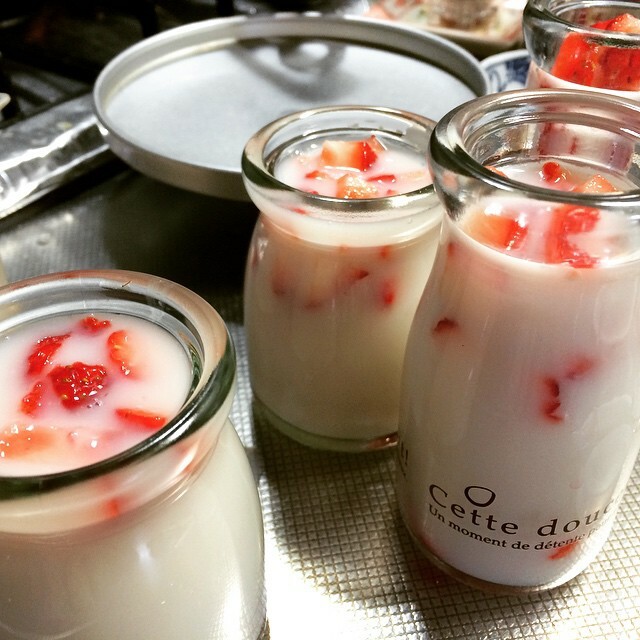 It's been awhile since I've made strawberry milk kanten. This time instead of milk I used almond milk. I had omitted the condensed milk because the almond milk had some sugar in it, but after tasting the finished product, I think I could've added it. I put them into the tiny yogurt pots and custard bottles that I have, they have covers so they are easy to store. 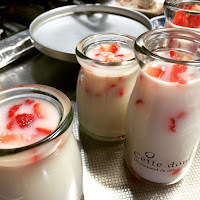 Strawberry season is coming to an end so I guess I'll be making these again next year. 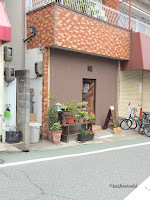 Over the winter season, I had passed this place, the door was closed, but the "open" sign was out front. 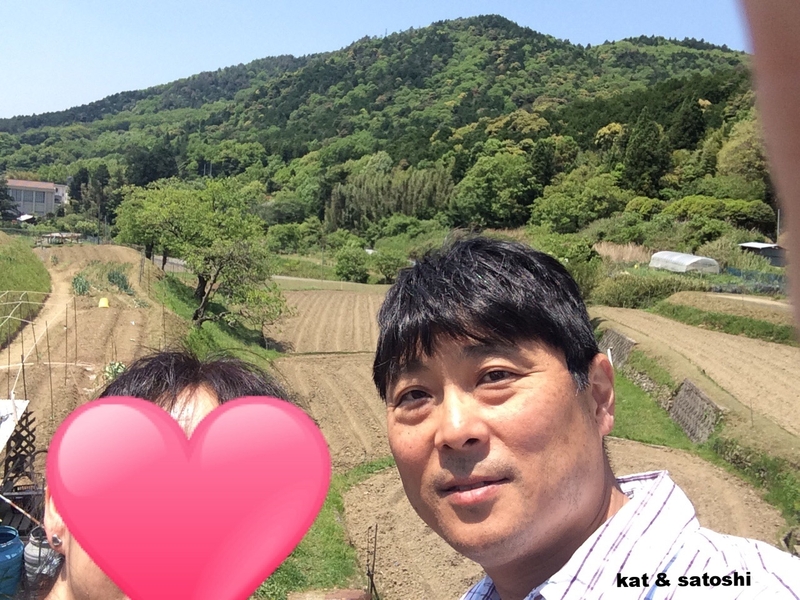 Since the place doesn't have any windows, I thought it was sort of sketchy and wanted to bring Satoshi with me to check it out. 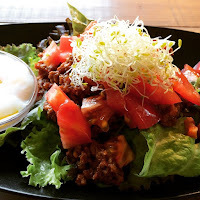 Then I checked out Tabelog (Japan's Yelp-like site) and realized it was a place that I had tagged to try. From the time I bookmarked the place, they had changed their name from Rakuda Curry to Cafe Rakuta and they moved closer to our area. On the last day of GW, we had tried to check them out, but there was a massive line. So, on Thursday, when everyone went back to work and school, I went to check them out. 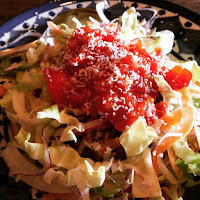 Since their FB page said they were serving taco rice, and I love the stuff, I ordered that...700 yen (tax included). Most times when I eat taco rice I use a spoon. Their veggies are sliced which made things a bit difficult. The meat and salsa are housemade and both have a slow burn. I want to go back and try their super spicy Keema...next time I'll try to bring Satoshi too. check out their FB page for hours, sometimes they change last minute. 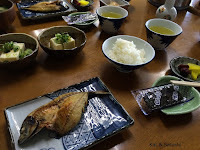 Breakfast was Japanese-style again and this time they offered to cook our "raw eggs"...whew! 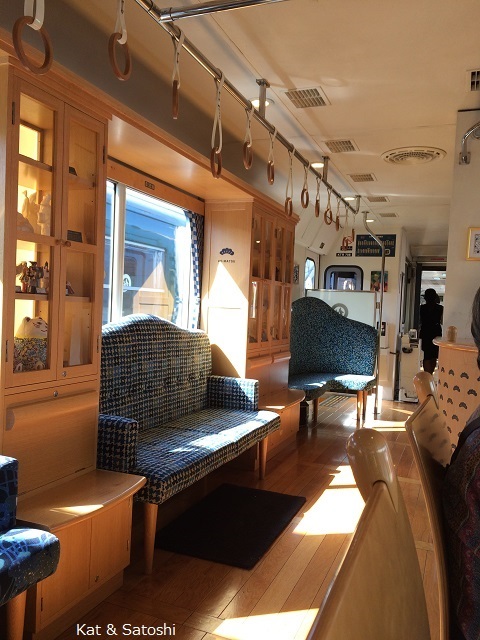 After breakfast, the minshuku dropped us off at the station and we were able to ride the Aomatsu (blue pine) train. Willer has three types, Akamatsu (red pine), Aomatsu (blue pine) and Kuromatsu (black pine) for various lines in the area, some are reservations only, some have extra fees and some can be ridden without added costs. 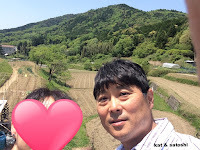 Aomatsu could be rode without added costs, so we were happy to be able to get seats. 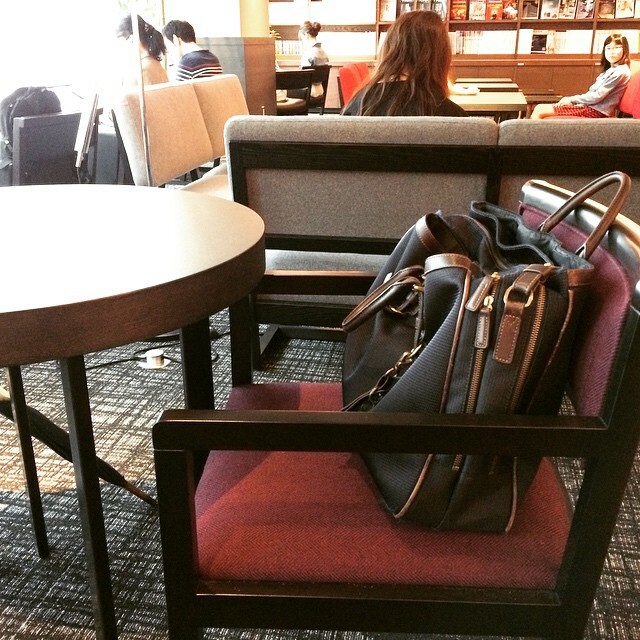 It was like sitting in a moving café. It was a great experience. 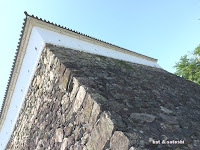 The first thing we did when we arrived in Fukuchiyama was get some coffee and then find the castle ruins. It takes about 10 minutes from the station to walk to the castle ruins. The inside of the castle is modernized, but you can see the city from the top. 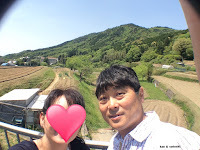 There were crazy Japanese people sticking their selfie sticks outside of the castle windows to take pictures of themselves inside the castle...geez! 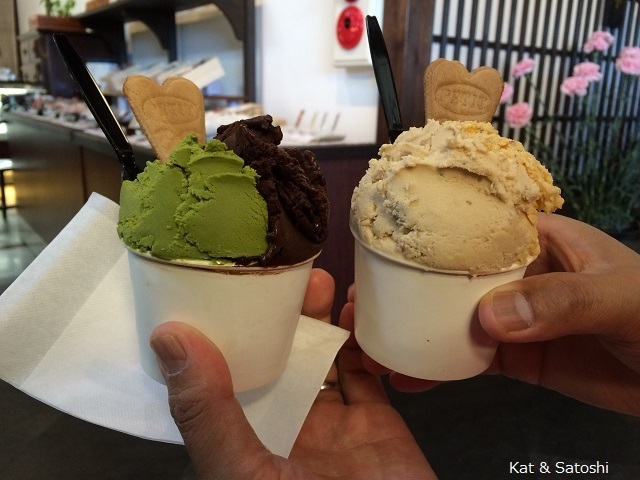 It was so hot that we stopped for some gelato at Adachi Otoemon. This Japanese confectioner makes lots of sweets using local Tamba kuri (chestnuts). 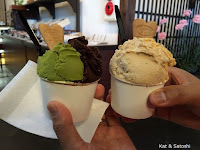 Satoshi ordered a 2 dip (flavors) with Marron gelato and Kuri (chestnut overkill?) his scoops had tons of chestnut bits in it. Delicious! I chose Uji matcha and bitter chocolate. The rich chocolate balanced out with the bitter matcha. 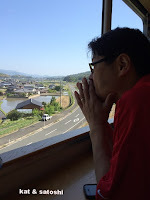 Refreshed, we checked out the Chisui (flood) museum. This museum is located in a restored home and provides information on floods and also teaches about flood control. 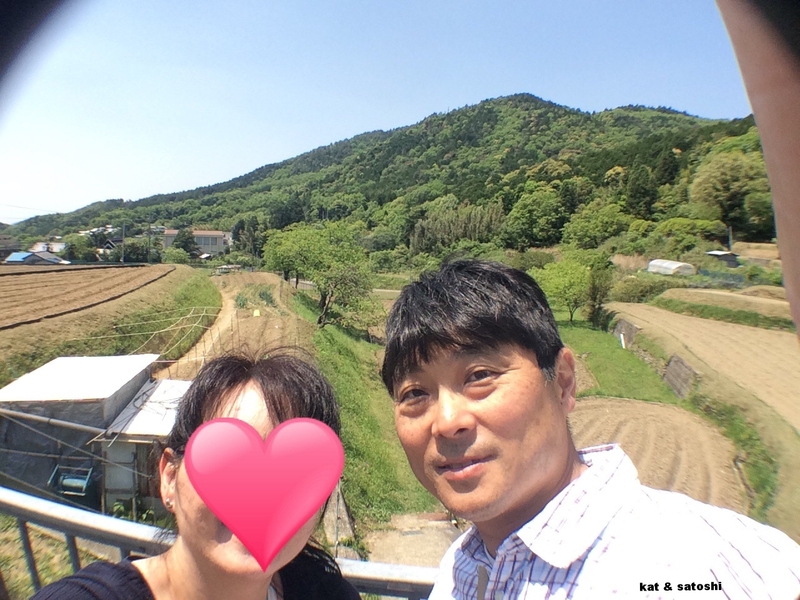 About a year or two ago, Fukuchiyama was flooded out. The volunteer explained that the older style home floors were protected with flood control techniques but the newly built home floors were destroyed with the flood. It was a neat and informative place to check out. Earlier while walking to the castle ruins, a banner caught my eye..."B-kyu gurume Gomuyakisoba". If you know some Japanese, you'll know that "gomu" means rubber...I knew we had to check out this place. I ordered the gomu yakisoba meshi and Satoshi ordered the gomu omusoba. The noodles were "rubbery" but what was interesting was the topping of a little marinara and basil mayo, which actually matched their yakisoba sauce. I'm glad we tried this! 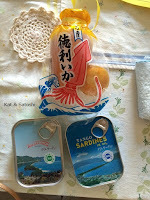 We brought home some canned sardines and a tokkuri ika. 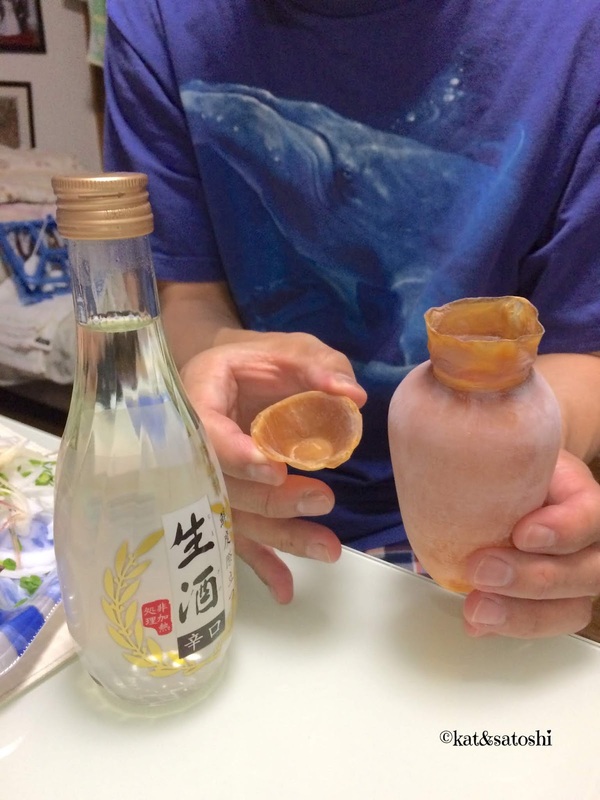 The squid is shaped and dried into a tokkuri (bottle) for you to put your sake into. 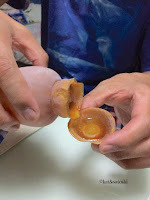 The top is shaped and dried into an ochoko (cup). 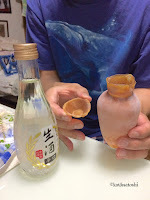 After drinking your sake from this several times, the squid becomes soft enough to eat as a chaser. I'll be sure to post about this when we try it. We had a nice time and for the most part the weather was cooperative. I hope you enjoyed our adventure as much as we did.